Over the next few weeks, Microsoft will begin offering a “Web browser choice screen” to Internet Explorer users in Europe, as required by the European Commission. Internal testing of the choice screen is underway now. Microsoft will begin a limited roll-out externally next week, and expect that a full scale roll-out will begin around March 1, 2010, a couple of weeks ahead of schedule. 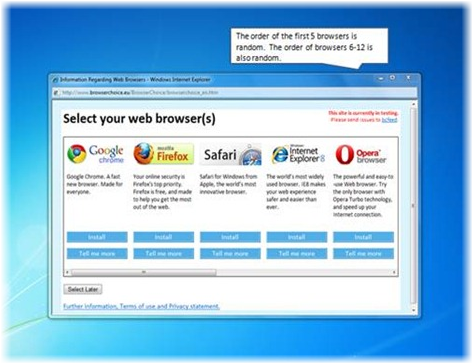 The browser choice screen, shown above, will present you with a list of leading browsers. This list is presented in random order. You can also scroll to the right to see additional browsers, which are also presented in random order. The browsers that are listed and the content relating to them will be updated from time to time. The screen provides three options: Click on “Install” to install one of the listed browsers. Click on “Tell me more” to get more information about any of the browsers. These links (and the browser logos and associated text) are provided by each browser vendor. Click on “Select Later” to review the choice screen the next time you log onto your computer. This software update will also add a shortcut to your desktop, from which you can launch the choice screen at any time. If you are an Internet Explorer user in Europe, visit Microsoft On The Issues to know what to expect.